The town of Battle grew up around the Abbey founded by King William after his victory at the Battle of Hastings in 1066. Before that the countryside was the home for Neolithic man and the Romans. Later iron workers, farmers, tanners, gunpowder manufacturers and clock makers made the Battle area their home. This independent museum, run by volunteers, offers a glimpse of Battle's rich history, from dinosaurs to life in the mid 20th century. There are many attractions from many periods, including: the only battle axehead from the Battle of Hastings yet found, the Charles Stothard engravings (c1818) of the Bayeux Tapestry, artefacts from the Roman Bath house at Beauport Park and the oldest Guy Fawkes in the world. The Museum now has an audio/visual centre 'LOCAL VISION' on which slideshows and film has expanded the access to the museums archives especially educational detail on the Bayeux Tapestry. 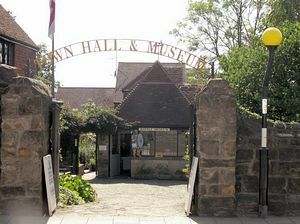 The Museum was founded by the Battle and District Historical Society in the early 1960s and moved to the medieval Almonry site in April 2003.